Universal Systems SE manufactures a premiere line of hot melt adhesive systems. Our ProBilt™ line of tanks all come with our patented AccuScan™ Control Panel. The AccuScan™ Control Panel is exclusive to ProBilt™ machines and is easy for any line operator to use. One of the most common feedback points we hear from customers is that they like simplified operational equipment. Usually line operators are understaffed and overworked. Simplifying how they use our equipment is a big selling point and the AccScan™ Control Panel is a great example of that. Universal Systems SE developed our AccuScan™ Control Panel to simplify the operation of our adhesive melter systems. The main control screen lists the operational settings for up to 4 hoses and guns and the main tank. You can filter through these sections by pressing the Zone button. Once you choose the zone you wish to set the temperature for, press and hold the Set button. Then, using the up arrow, the digital screen will show the temperature setting increase until you reach your desired temperature setting. Once the tank or hose zones are set to desired temperatures, release the Set button. We also offer a Set Back button on the main screen. The Set Back feature puts the machine in an idle state, heating only to 165 degrees. For further step by step instructions, we have put a video on our Universal Systems SE YouTube channel. Please check it out at https://youtu.be/QhSCXZs-8wY. For any further instructions or information about our AccuScan™ Control Panel please call (561) 272-5442 or email sales@ussefl.com. The packaging industry is entering the time of year when budgets are getting tight, but replacement parts are still needed. Universal Systems SE will cross-reference any of our competitor item numbers and get you high quality replacements. Cross-referencing Nordson item numbers to Universal Systems SE item numbers will help to lower your cost and keep your packaging lines running longer! You will also notice that our competitors change their part number often. This is why we offer the search bar on our website for any cross-reference numbers you might have. Some of the most common cross references are listed below. If you purchase any of the parts listed on a regular basis, please feel free to call us today! We guarantee that all of our products are quality control tested before leaving our facility and we stand by all of our products with strong warranties. For any other questions on cross-referencing, please call (561) 272-5442 or email sales@ussefl.com. There are a couple different types of filters that you need to change out regularly on your adhesive melter system. One is a tank filter, which we describe in a previous article: The Importance of Tank Filters. The second, is the in-line gun filter. This is the filter that goes between the hot melt gun applicator and heated hose. This is the last line of defense against char being transferred through the module and potentially clogging the nozzle. There are a three different in-line filter assemblies that are available for your hot melt system: Straight, 45 Degree & 90 Degree. The first is a filter assembly with a straight connector from the gun to the hose. This straight fitting is used when guns line up directly with hoses, typically applying the glue straight out to onto the boxes. 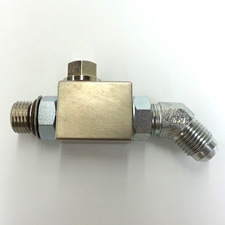 The other two filter assemblies offer a 45 degree and 90 degree fitting that allows you to connect the hose to the gun at an angle. These filter assemblies are mostly used on setups where the applicator guns are either above or below the packaging line. Each filter assembly is available with 50 mesh, 100 mesh and 200 mesh filters. The replacement filters are sold separately in packs of 5 for easy installation so that you do not need to switch out the entire assembly. The filter is easily screwed into the top of the filter body as seen below. Please make sure that you lubricate the o-rings before installation to help you for future filter changes. For more information on which in-line filter assembly is best for you, please call (561) 272-5442 or email sales@ussefl.com. Hot melt adhesive application nozzles, or nozzle tips as they are commonly called, are the component that apply the glue onto boxes in packaging lines. Universal Systems nozzles are made out of brass with stainless steel tips to withstanding any beating they might take from box flaps in the packaging line. Nozzles comes in many shapes and sizes, and are usually the part on the adhesive system that is most experimented with. Most nozzles are easily changed out by simply unscrewing them from the module. Other nozzles, like the ones on reduced cavity, zero cavity and ProBead modules are called integrated nozzles. We sell replacement nozzle kits for integrated nozzles that include the nozzle tip, needle, brass needle guide and installation tool. The diameter of the nozzle tip determines the amount of adhesive that is distributed onto the box flap. Because you can easily switch them out, most line operators experiment with diameter to enhance productivity. For example, smaller, more precise glue application will require a smaller diameter nozzle. Larger, faster cartoners, will most likely run larger diameter nozzles to distribute a greater amount of glue and quickly seal boxes. Keep in mind that the larger the diameter nozzle, the more adhesive your tank will process. So make sure that your line operators are keeping a close eye on the adhesive level in the tanks. Dry running a machine can compromise your pump and create a costlier repair. Because most adhesive systems run 24/7, the nozzle is the most commonly clogged component on your line. This is due to char or debris travelling from the tank, through the hose, into the gun and through the module. Because the nozzle is the smallest orifice on your system, most char will get stuck and you will be unable to get a consistent adhesive flow. Universal Systems SE offers nozzle cleaning kits that you can purchase instead of replacing nozzles. However, most line operators find the cleaning of nozzles a tedious process, even though when done correctly it works. Nozzle cleaning kits can save you money in the long run on replacing nozzles. Another important aspect of nozzle diameter correlates to the size of the mesh in-line filter used on your system. The larger the diameter nozzle, the lower number mesh you should use. The smaller the diameter nozzle, the finer mesh you should use. For example, with a .024 diameter nozzle, you should have a 50 mesh filter size. With a .012 diameter nozzle, you should use 200 mesh filters. For more information about what diameter nozzle you should be using, call (561) 272-5442 or email sales@ussefl.com.